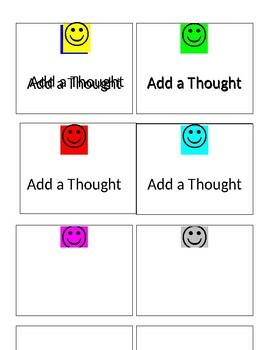 Cut cards out and assign each student/client a colored card; they add a card each time they add a 'thought' to the conversation. Can be used in a social group setting. After the conversation, you can discuss with students who made too many comments or who did not make any. Can also use these cards to work with students to stay on topic; you can place a card on the written topic on the table or away from the topic if they make an off topic comment. Adapted from Social Thinking curriculum.